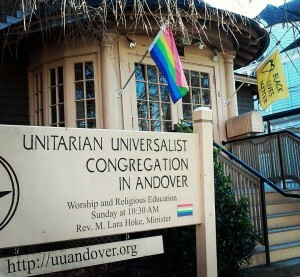 The Unitarian Universalist Congregation in Andover (UUCiA) formed from two separate congregations, each founded in 1847 in the nearby city of Lawrence, Massachusetts. 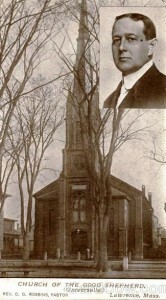 Those two congregations were the Universalist Society of Lawrence and the Parish of the First Unitarian Society in Lawrence. 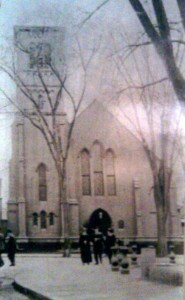 The home of the Universalist Society of Lawrence and, later, the Church of the Good Shepherd, Unitarian Universalist. The inset is Rev. C. Guy Robbins, the longest-serving minister of the congregation. The Parish of the First Unitarian Society in Lawrence. The class difference between the Universalists (predominantly “blue collar”) and the Unitarians (predominantly “white collar”) in Lawrence also mirrors the historical national patterns for these denominations. 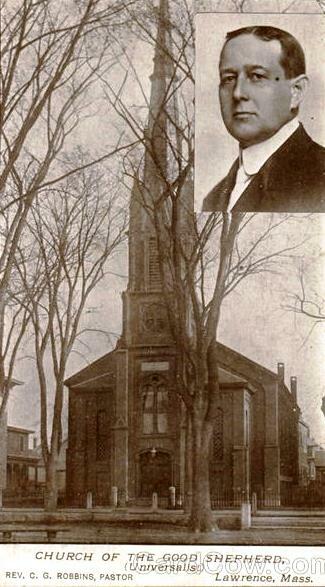 A century later, both congregations found that they had dwindling memberships. Overcoming their class and cultural differences , the two congregations decided to merge in 1956 and become the Church of the Good Shepherd, Unitarian Universalist. Interestingly, this Lawrence merger of Universalists and Unitarians pre-dated the national merger of these two denominations by five years. The former home of the Unitarian Universalist Church of Andover on Lowell Street, currently home of the North Boston Korean Methodst Church. The Church of the Good Shepherd commissioned a study to see what they might do in order to increase membership; the study suggested that the congregation should move to a nearby suburb. Subsequently, the congregation moved to Andover in 1964, changing its name to the Unitarian Universalist Church of Andover. It had a brand new building at 244 Lowell Street, a contemporary structure with a striking sanctuary; unfortunately, it proved to have design flaws that led to issues such as leaking roofs, prohibitive heating costs and maintenance needs. In 1980, this building was sold to the North Boston Korean Methodist Church. UUCiA’s current building on Locke Street in Andover, formerly the November Club’s building. 6 Locke Street in Andover. This historic shingle-style building was built in 1892 by the November Club, which was New England’s first women’s clubhouse. 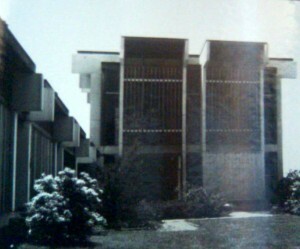 The congregation purchased this building in 1985, two years later doing significant renovations including the addition of Johnson Hall on the lower level. In 1994, the congregation changed its name from the “UU Church of Andover” to the “UU Congregation in Andover”, in recognition of their religious and demographic diversity. Interestingly, there was a Universalist congregation in Andover in the 1860s (on the corner of Punchard Street and Main Street), but this congregation did not survive to become part of the present-day UUCiA merged body. Though the UUCiA is no longer physically located in Lawrence, the congregation continues to connect with its Lawrence roots by participating in such organizations as Habitat for Humanity, Bread & Roses, Lawrence Community Works, and more. The UUCiA in 2015, displaying both a rainbow flag and a Black Lives Matter flag. The UUCiA became a “Welcoming Congregation” in 1994, making it among the earliest of the congregations of the Unitarian Universalist Association (UUA) to intentionally welcome and affirm LGBTQ persons. In 2015, the congregation became one of the early members of the UUA to display a Black Lives Matter flag. 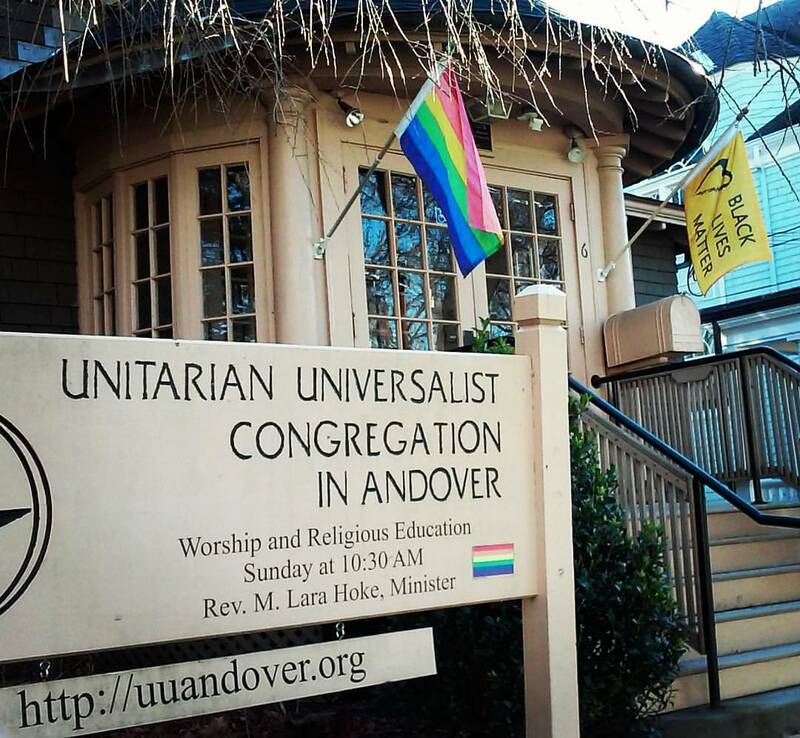 As noted above, the Unitarian Universalist Congregation in Andover got its name in 1994. Prior to that, from 1964-1993, it was the “Unitarian Universalist Church of Andover”. From 1956-1963, it was the “Church of the Good Shepherd, Unitarian Universalist”.